Though the island is waiting for results of an official study, the report states some estimates range from 800 to over 8,000. SAN JUAN, Puerto Rico — Nearly a year after Hurricane Maria, the government of Puerto Rico stated in a report released Thursday that more than 1,400 people died in the four months after the storm — a significantly higher death toll than the government has claimed. “According to initial reports, 64 lives were lost. That estimate was later revised to 1,427,” read an earlier draft of the report; the final version was submitted Thursday to the federal government. Officials said other studies have found that hurricane-related deaths could range from 800 to over 8,000. The Puerto Rican government said Thursday, however, that it was not updating the official death count until George Washington University publishes their study — which the government commissioned for more than $300,000. This is not the first time that the government of Puerto Rico has suggested that Hurricane Maria’s death toll surpassed 64. Days after a study from Harvard estimated that Hurricane Maria’s death toll was 70 times higher than Puerto Rico's official estimate, pro-transparency groups in Puerto Rico, media outlets and the Puerto Rico Institute of Statistics (PRIS) sued the island’s Demographic Registry over death count data. The report was authored in an effort to comply with the Bipartisan Budget Act of 2018. The report is the first step in a long process to allocate appropriate federal funds for Puerto Rico’s reconstruction. After much public pressure, the Demographic Registry released part of the mortality data many have spent months asking for on June 1. The preliminary data only revealed the total count of deaths per month. Responding to the attention following Thursday's report, Puerto Rico's Public Safety secretary, Hector Pesquera, elaborated the government's figures in a statement. 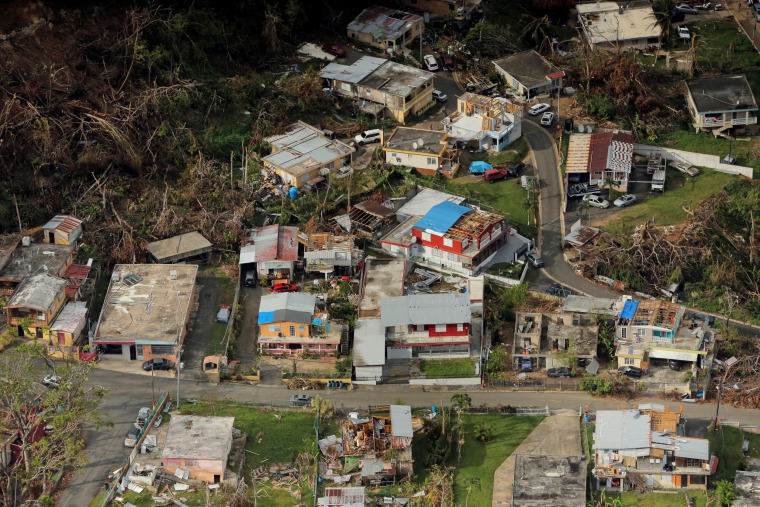 "On June 1, the Puerto Rico Demographic Registry released data to the media which indicated there was an excess of 1,400 deaths in the four months following Hurricane María. That number was not the result of an independent study—it is simple math. This is not the official number of deaths attributable to Hurricane María," said Pesquera, whose department released the official number of 64 deaths. Even though the government is acknowledging that more than 1,400 deaths took place in the months after Maria, public officials like Rolando Ortiz, the mayor of the town of Cayey, said that even the new number doesn't reflect the reality he lived in his town months after the hurricane. "The numbers from the government seem low to me still," Ortiz told NBC News. "But, the reality is that the people who died... died. And it's painful because those are human lives, but this is evidence of the government's inability to tell the truth. That's the most terrifying news." The newly released report also acknowledges that other studies have estimated Hurricane Maria’s death toll at around 1,000. “Similarly, independent researchers analyzing vital statistics data found that about 1,000 more people died in September and October 2017 than normal, largely in the hurricane’s path or in mountainous rural areas,” the report reads. “A much-publicized Harvard study estimated hurricane deaths likely ranged from about 800 to 8,500 due to indirect causes, such as delayed or interrupted health care,” the report states.